← The Things They Carried” by Tim O’Brian – The things I carry always. I’ve not run since Saturday because of a stomach virus I seem to have caught from a generous person at work. Seem’s like i’m jumping from sickness to sickness. I should retire so all I have to do is run and not be around people who come to work sick. Anyhow, growing up with my Dad all I ever had on my bed was a sheet and U.S. Navy Gray or Green wool blanket. On weekends and days off school I would wander in the living room wrapped up in my wool blanket and lay on the couch staring out of the big picture windows or watching cartoons if our TV happened to be working. I remember my Dad sitting next to me and rubbing my back though my wool blanket adding that bit of warmth you get from a parents gentle touch. Wool blankets are full of memories for me and have always been a part of my life. 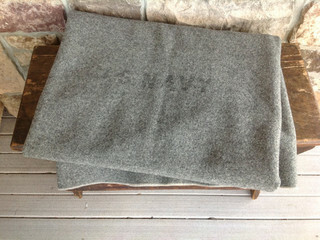 When I joined the NAVY my issued wool blanket gave me a bit of home at night; unbeknownst to my company commanders. My wool blanket was always there for me when I came back to the barracks from duty or the field on active duty, keeping me warm in the winters and cool in the summer. When I returned back to the real world, I dragged my wool blanket back with me and although its not the same wool blanket I had from my childhood it still comforted me the same. I still have my wool blanket although for much of the time it resides in a plastic box in my closet as my wife complains its too itchy to have on the bed. But when I don’t feel well its my wool blanket that I get and sleep with, my wife to her credit, puts up with my wool blanket in these instances because she knows it makes me feel better. But the best thing about being wrapped up in my wool blanket; is it reminds me of my Dad and how he rubbed my back though the old wool blanket he gave me. This entry was posted in family, Family History, health, remember, Running and tagged Memories, running, sick, wool blanket. Bookmark the permalink. Ohhh how I love this. The blanket story, not the sickness. Feel better STAT! Beautiful story. Thanks for writing it to share with us. Thanks Rod, that story is a perfect example of how not to write and to not write while eating breakfast. I did some editing just now. Ugh I should have not rushed in the first place! Where have you been? It’s been my busy season with work as clients rush in to use their benefits before year end. Sorry I’ve been out of the loop for a bit. Not really, my stomic hurt everytime I eat or drink something. Worse when I’m active. But hurt or not I’m going to run tomorrow. I need to keep my miles up the Disney run is only 3 week and some change away. Missed you out here in blog land. Wow! Time has flown by. 3+ weeks. Holy! Excited/nervous? Did you run today? How’d it go? It’s heart warming. I mean the story. OK, the wool blanket too! I hope your training has been going really well. Life has again taken over in terms of my own updates, but I often remind myself that I need to come on to check your progress and offer some encouragement if any is needed. Not long to go until the ‘big day’s’ now, but whatever happens at this point, you will have had a remarkable year and the best part is you have often involved your family along the way. All the best Happy Christmas, Happy New year and good luck! Wow good to hear from you! Yes life has got in the way here as well over the past few weeks. I ‘think’ I’m ready I feel like it at least. I’m ready for it to be over LOL I want a reasonable running schedule again 30 mile weeks have begun to wear on me. 9 days to go so I guess we shall see! Hope you and your family had a wonderful Christmas and hope you all have a Happy New Year 🙂 chat soon!